2016 recruit Kieffer Bellows, who set a USHL scoring record and helped lead Sioux Falls to the 2015 Clark Cup Championship, will spend next season as a member of USA Hockey’s NTDP U18s. The left-shot power forward from Edina, Minn., will join two other BU 2016 recruits, center Clayton Keller and goalie Jake Oettinger, on the Ann Arbor-based team. BU fans will have an opportunity to see the trio in action on October 16 when the U18s take on the Terriers at Agganis Arena. Bellows, named the USHL’s rookie of the year, scored 33 regular-season goals—including 29 in his last 39 games—which is the most by a 16 year old since the USHL became a Tier 1 league. In the playoffs, Bellows scored nine more goals, including four game-winners. 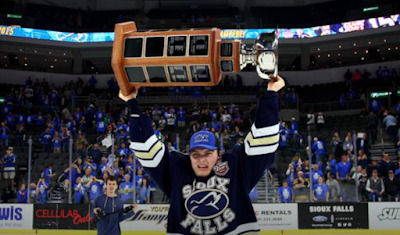 The final goal was the game-winner in the victory against Tri-City that clinched the championship for the Stampede. 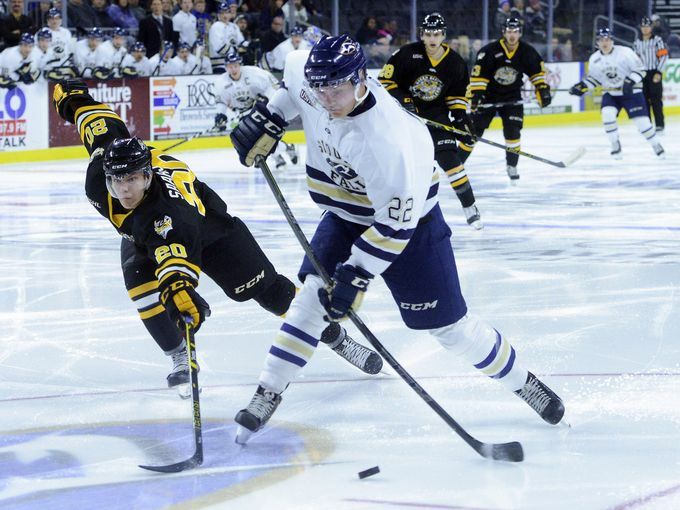 Bellows also earned all-USHL third-team honors. ► During a segment of Hockey Night in Canada's "Coach's Corner" Monday night, freshman Jack Eichel drew some laughs when he presented a USA Hockey shirt (video) to uber-pro-Canadian Don Cherry with a USA Hockey shirt for his "support" of US hockey. ►SB Nation ran a story noting that Connor McDavid, the Erie Otter forward anticipated to be the #1 pick in the NHL draft, ahead of #2 Eichel, had once given some consideration to playing NCAA hockey at BU. And USHR reported that the two standouts nearly faced each other on the Walter Brown Arena in the Fall of 2011 during a USHR-sponsored tournament. Former Terrier captain Wade Megan has signed a one-year contract with the AHL Portland Pirates, an affiliate of the Florida Panthers. He had split the past two seasons between ECHL Cincinnati and AHL San Antonio.